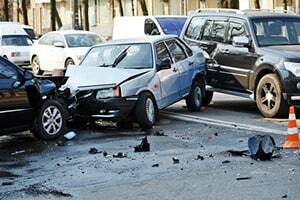 Chain Reaction Accidents | Nashville Auto Injury Lawyer The Law Offices of John Day, P.C. Contact Tennessee Car Accident Attorney The Law Offices of John Day, P.C. Driver 1 fails to stop in time hitting Driver 2’s vehicle in the rear. The force of the impact pushes Driver 2 into the rear of the vehicle driven by Driver 3. Driver 1 slows to make a turn. Driver 2 is not paying attention and/or following too closely and impacts the rear of the vehicle driven by Driver 2. Driver 3 is also not paying attention and hits Driver 2 forcing Driver 2 into a second impact with Driver 1. Driver 1 loses control crosses the center-line and impacts the front of the vehicle driven by Driver 2 pushing him into Driver 3 in the adjacent lane. Driver 1 loses control and impacts the lead vehicle sitting at a red light which then crashes the lead vehicle into a vehicle behind him. Or consider the California case where a biker, angry that he had been cut-off, kicks the side of a sedan triggering a violent chain reaction accident that was caught on video. Chain reaction accidents can often lead to impacts between vehicles and humans because the natural reaction after an accident is to get out and check on the other people involved. However, depending upon road conditions and visibility, this can put individuals at risk of being struck by another vehicle as it approaches the scene of the accident. Bringing a claim for a chain reaction accident can sometimes be challenging. In Tennessee, an injury victim must prove three things in order to recover for injuries sustained in a car accident: (1) who was at fault for the accident; (2) what damages were caused by the impact(s) -- this is commonly referred to as causation; (3) the nature and extent of your damages. Since a chain reaction accident involves multiple impacts, there may be more than one person at fault. While generally, the driver who caused the first impact is the at-fault party, other issues can arise. For instance, did Driver 1 hit Driver 2 and force Driver 1 into Driver 3 because Driver 1’s brake lights were not working? Was Driver 1 operating under the influence of drugs and alcohol or was Driver 1 texting and that is why he or she did not notice Driver 2 slowing even in the absence of brake lights? Was the vehicle driven by Driver 2 defective causing it to catch on fire in what was only a mild to moderate impact? What to do After a Chain Reaction Accident? First and foremost, if visibility is low due to weather, road conditions, etc., stay in your car until emergency personnel arrive so that you are not struck by another car approaching the scene of the accident. Two, as with most accidents, photographs of the cars and the overall scene are tremendously helpful when later making a claim. Likewise, securing the names and contact information of eyewitnesses is incredibly valuable. For more tips on what to do after any type of car accident, click here. Finally, if you suffered serious injuries, contact a lawyer who can help you receive all of the compensation to which you are entitled from all at-fault parties. At The Law Offices of John Day, P.C. we offer a free, no-obligation consultation for all accident cases, and our award-winning lawyers handle all accident cases on a contingency basis so we only get paid if we win. And unlike some lawyers, we advance all case expenses without charging interest, so that you do not have to pay anything out of pocket to pursue your rights. For more information on how we handle fees and expenses, click here. To get started, just give us a call at 615-742-4880 (Nashville) or 615-867-9900 (Murfreesboro) or 866.812.8787 (toll-free).